Entrepreneurs are always on the go, looking for the next "startup" challenge. And while they lead very intensely rewarding lives, time is always short and relationships are often long-distant and stressed because of extended periods apart. Coping with these, and other obstacles, are critical if an entrepreneur and their partner intend on staying together--and staying happy. In Startup Life, Brad Feld--a Boulder, Colorado-based entrepreneur turned-venture capitalist--shares his own personal experiences with his wife Amy, offering a series of rich insights into successfully leading a balanced life as a human being who wants to play as hard as he works and who wants to be as fulfilled in life and in work. 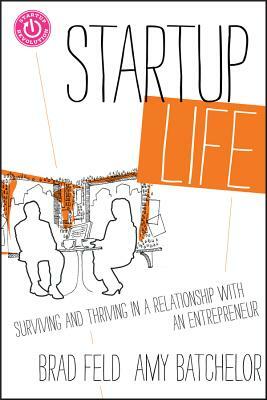 With this book, Feld distills his twenty years of experience in this field to addresses how the village of startup people can put aside their workaholic ways and lead rewarding lives in all respects. BRAD FELD has been an early-stage investor and entrepreneur for over twenty years. Prior to cofounding Foundry Group--a Boulder, Colorado-based early-stage venture capital fund that invests in information technology companies all over the United States--he cofounded Mobius Venture Capital and, prior to that, founded Intensity Ventures, a company that helped launch and operate software companies. Feld is also a cofounder of TechStars and has been active with several nonprofit organizations. He is a nationally recognized speaker on the topics of venture capital investing and entrepreneurship. AMY BATCHELOR is a Managing Director of the Anchor Point Fund, which makes grants to nonprofit organizations in the arts, education, entrepreneurship, conservation and the environment, health and human services, women's and human rights, international development, capacity building, and progressive public policy. She is a cofounder and partner of Social Venture Partners Boulder County and currently serves on the Board of Trustees at Wellesley College. She blogs at http: //anchorpoint.blogs.com/ and can be found on Twitter (@abatchelor) and Facebook (amy.batchelor). She is working on two novels, The North Side of Trees and Epicenter, about the 1964 Alaska earthquake. Batchelor graduated from Wellesley College in 1988 with a BA in political philosophy. She lives in Boulder, Colorado, and has homes in Keystone, Colorado, and Homer, Alaska, where she was born. Batchelor travels extensively and has spent time on every continent except Antarctica.